The proposal happened when we were away in a little village called Castleton in the Peak District in August. The weekend away was a birthday present from Sean and I later found out he’d had the proposal planned since before my birthday in April. We went for a beautiful meal and I popped to the toilet. When I returned to the table there was a ring box in front of me. He then got down on one knee and popped the question. 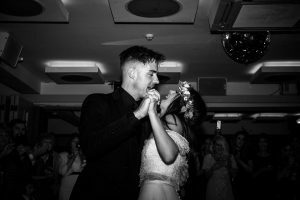 We got married at the Electric Cinema in Birmingham and then had the reception at The Penthouse above The Loft. 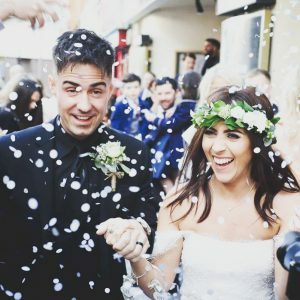 We are both big film lovers and knew that we wanted our venue to be something a bit different. I knew that you could get married at the Electric so we booked a meeting and from the minute we stepped in there we couldn’t see us saying ‘I do’ anywhere else. The Penthouse was perfect for us, we wanted our pictures to be very urban and the room was right in the city centre with such a good vibe. We knew we were going to be in for a great party. I found the boutique as I knew I wanted to look for a two piece dress and this had been recommended to me by a friend. I came with my Mom and sister and instantly fell in love with the boutique and the quirky dresses. I knew I wanted a top and a skirt from the start and as soon as I saw the selection in the boutique I was excited. The beaded top stood out to me instantly and I loved the looked of the dropped sleeves. It was so delicate and very boho. I tried this top on with a couple of skirts but knew I needed the Jesus skirt to go with it. I just fell in love with all of the tulle and how the simple skirt contrasted the fitted, intricate beaded top. The two-piece made me feel like a princess and I knew my search for the one was over. I think the thing i loved most about the dress was definitely the dropped sleeves and how they finished off my look perfectly. Accessorising the dress was my favourite part. I knew I wanted a crown and no veil but initially wanted a silver star crown. 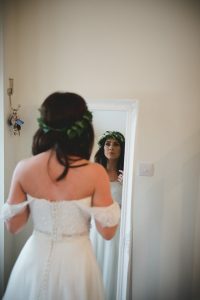 Once I’d chosen my dress I knew a flower crown would complete the boho feel and when i saw the crown and the dress together I felt like a fairy. I searched for the crown on etsy and came across a seller called Polpia. Her stuff was gorgeous, when I saw the eucalyptus in this crown I was instantly drawn to it. It tied in with my bouquet and the centrepieces and it couldn’t have been any more perfect. My necklace was a present from my mom and was stunning. As the top was so detailed I wanted something extremely delicate, the short chain and tiny heart worked so well with the dress and headpiece. I had three bridesmaids, my sister, who was my Maid of honour, my cousin and my best friend. I ordered lots of different dresses for the girls to try on but none quite made the grade. Someone then showed me bridal collection from Monsoon and I fell in love. There were so many to choose from, however, with it being February I wanted the girls to have sleeves. With the flutter cap sleeves and the split at the front each girl looked like a film star and we were so pleased with the dresses. Sean had two best men and one usher. They all wore bespoke suits by Clements and Church. Sean is a lover of black and knew he wanted a black suit from the start. He had two shirts, one white and one black made for him and after some debate decided on an all black look, suit, shirt and tie. I was so pleased as this was very him. The big day went by in a flash! I was surprisingly calm which will be a shock to anyone who knows me. From the minute I woke up to the moment I went to bed I had so much fun, as did Sean and all of the guests. We wanted our wedding to have a chilled but party vibe. We didn’t want it to be too formal and we wanted people to feel they could relax and have fun from the start. Which was evident when guests were up on the dancefloor and jagers were being consumed before the second course had been bought out!! I have so many favourite moments its hard to name just one but the speeches were a massive highlight for me. And most definitely the first dance. Seeing everyone you love surrounding you and your partner, cheering you on is amazing. Then to have everyone join you on the dancefloor! Best feeling ever. And of course going to bed as Mrs Rogers was pretty good too. Thanks so much for helping me to pick the dress of my dreams! Our bride Katie, was truly a stunning bride and her vision for the perfect wedding was embodied in emotion and individuality! We’d like to thank Katie for taking the time to talk about her wedding day and the intricate details. Katie Wears separates by Jesus Peiro from our boutique.